Happy Halloween! Let me tell you why I'm so excited about Halloween this year....I finally have a reason to celebrate it: my little 11-month old baby! And let me tell you how adorable he looks in his costume. Any holiday is a good excuse to bake cupcakes, so here's another great recipe from Love From the Oven. The recipe is actually one that's modified from McCormick, with cake pops added on top. Have a fun and safe Halloween! And make sure you "test" all of your kids candy. Pumpkin brownie cupcakes? What does that even mean? I'm already hooked on Picky Palate's recipe! I love simple recipes and this is another to add to the list. 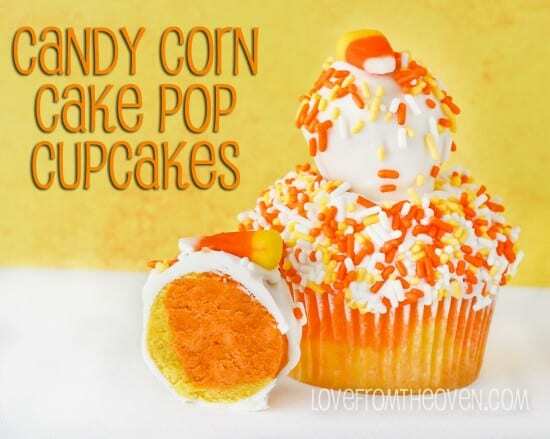 There are just a handful of simple ingredients in this cupcake recipe, including a yellow cake mix, a brownie mix, and a can of pumpkin. 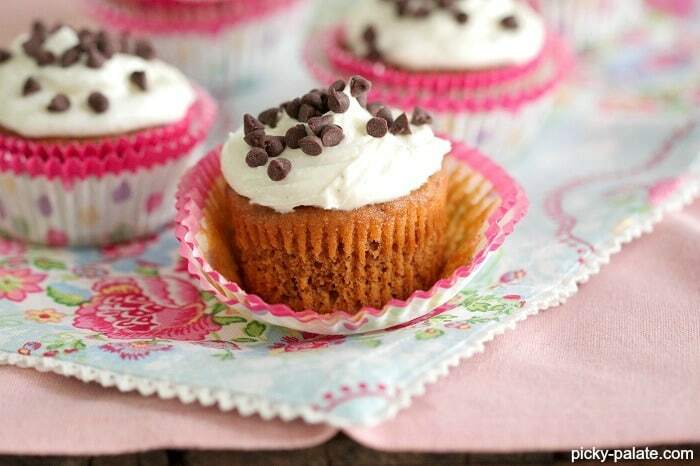 Ahhh, so that's why they are called pumpkin brownies cupcakes. I've already expressed my love of pumpkin, so you know I'll be bookmarking this recipe. You should too. Check out the full recipe here. 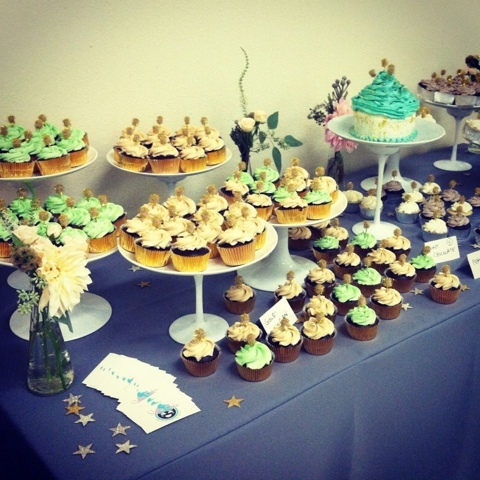 I couldn't have been happier to attend a wedding last weekend and see cupcakes on the dessert table! They paired perfectly with the burger bar and homemade root beer. That's my kind of wedding! 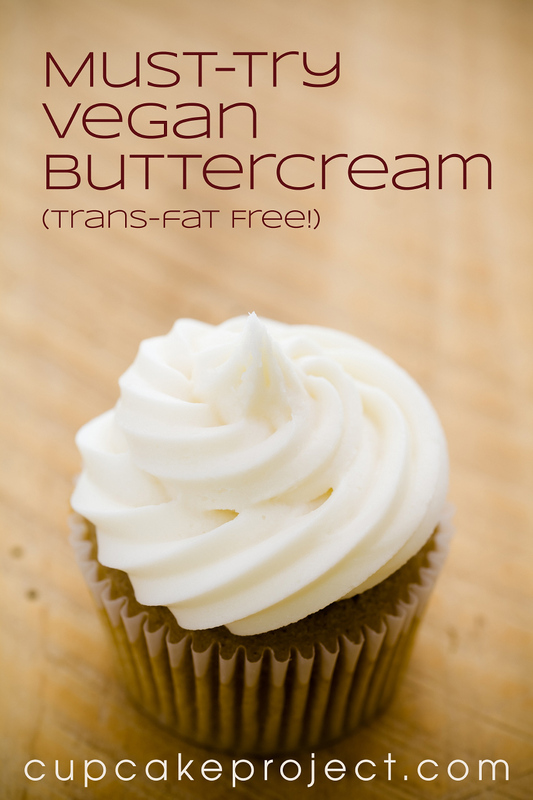 I hate to say it, but I haven't been wowed by a vegan cupcake yet. Yet is the key word. I'm still open to trying again. 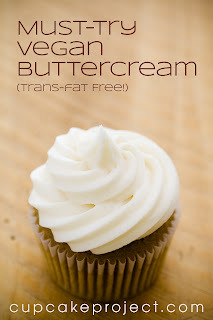 Cupcake Project recently posted a recipe for vegan buttercream frosting. This recipe uses homemade vegan butter (you can find the recipe for that here), which has quite a few ingredients I've never worked with, such as liquid soy lecithin and xanthan gum. I'm not sure I will make it, but I would definitely try it. I'm still a bit skeptical because how could vegan butter taste better than cold, unsalted butter. Thoughts? 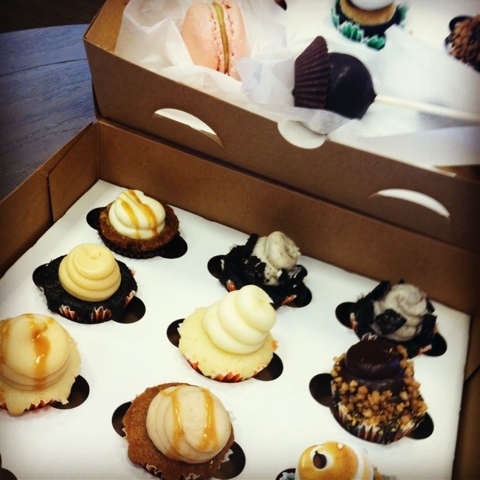 This is definitely what my world needs: edible cupcake stands! Because why not? Best Friends for Frosting came up with the idea for these. Upside-down ice cream cone, a flat cookie, a bit of frosting, and some sprinkles and you have the perfect cupcake stand! There are a few tips on the website, so check out the full post here. 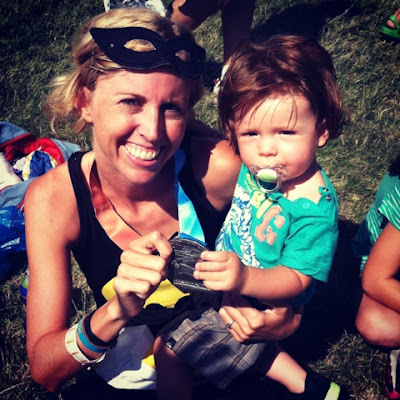 A few weeks ago I raced Orangeman, an iron-distance triathlon, meaning 1.2 mile swim, 56 mile bike, and 13.1 run. I've done several of these races before, but this was the first time I crashed. What?! Yes I crashed on my bike for the first time ever! It was a stupid accident where caution tape got tangled in my bike handlebars and at 18 mph I went down hard on asphalt. 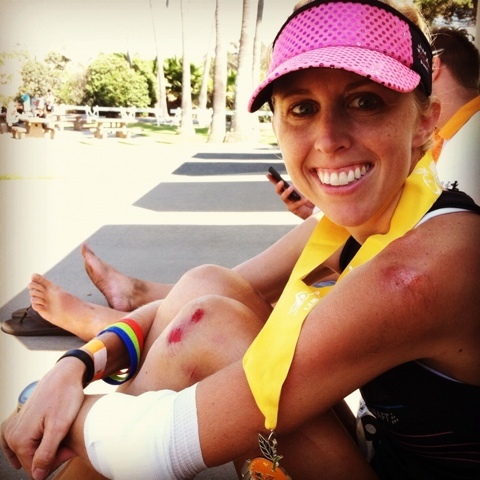 Luckily I was only 3 miles from the end of the bike course, so after I got attended to by the paramedics, I rode my bike back and finished the race by running 13.1 miles. I would say that deserves some cupcakes, right? It wasn't hard to convince my friend Jill to join me for a trip to Sweet and Saucy Shop in Newport Beach, CA. Between the two of us, we ordered one of everything. 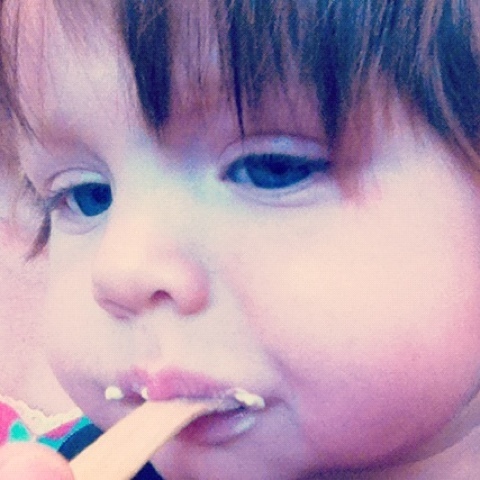 Yeah, we are that serious about cupcake eating. 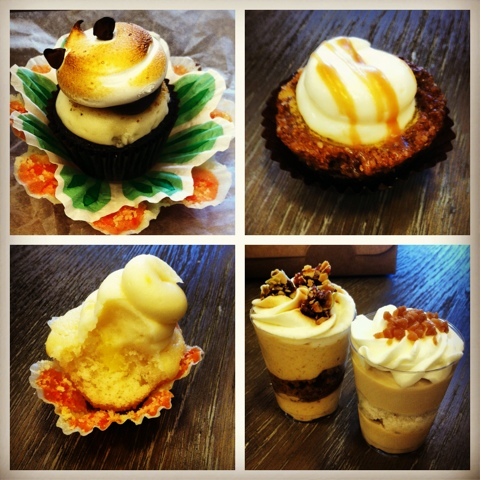 I've been to Sweet and Saucy Shop before, but I tried a few new items this time: S'mores cupcake, mini pumpkin cheesecake, lemon cupcake, pumpkin mousse dessert shot, and butterscotch dessert shot. Loved everything...enough said! Desmond might have tasted his first taste of whipped cream. Shhhh! Don't tell my husband! My favorite time of year means my favorite kind of cupcakes: pumpkin! I've got to try out this recipe from Two Peas and Their Pod for Brown Butter Pumpkin Cupcakes with Salted Caramel Frosting. I'm very interested to see how this frosting pairs with the cupcakes, as I usually see cream cheese frosting with pumpkin cupcakes. Guess I need to bake them to find out! This episode had bakers competing to display at a exclusive party to honor Big Time Rush, a Nickelodean TV show about a boy band. I thought it was funny that all the bakers were young girls, especially since the TV show featured a boy band. Coincidence or just funny? Cupcake Camp OC 2012 is Coming! The date and location for the 3rd annual Cupcake Camp OC have been announced. This year's event will take place on Saturday, December 1st at Piecemakers Country Store in Costa Mesa, CA. The event will host a cupcake competition, cupcake tasting, food trucks, and vendors. Registration is now open for bakers and vendors. You can find all info, as well as registration pages on the Cupcake Camp OC website. I've enjoyed attending this event the past two years and hope this year's event is even better. It's no secret that I love cupcakes and all sweet things. But did you know I'm also a hard-core triathlete? Yeah, exact opposites, but it balances me out. My motto is: I burn calories to eat them. Last weekend I ran the Long Beach marathon with my BRFs (Best Running Friends) and BFFs. 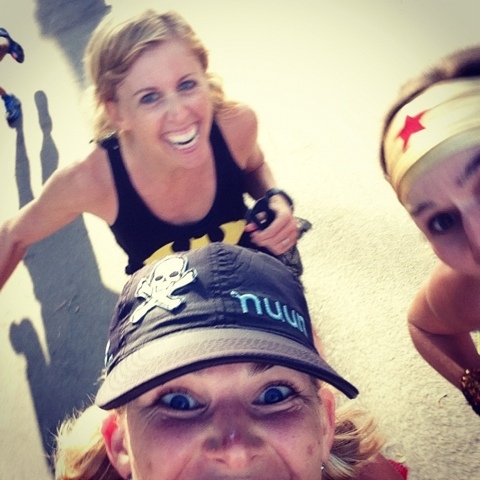 We take running seriously, but we like to have fun more. So of course we dressed up as our favorite superheroes. 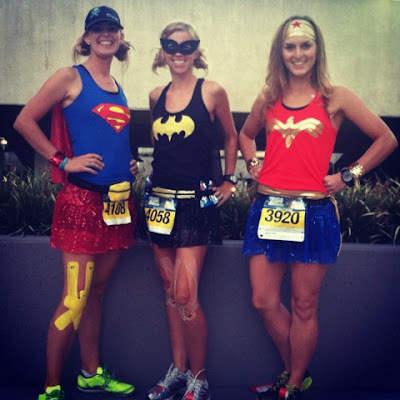 Superwoman (Kelly), Batgirl (me), and Wonder Woman (Carrie) flew through the marathon course. We got lots of compliments and had a great time being goofy and chatting the whole way. Two of us ran our way to our best times (3:58:39)! 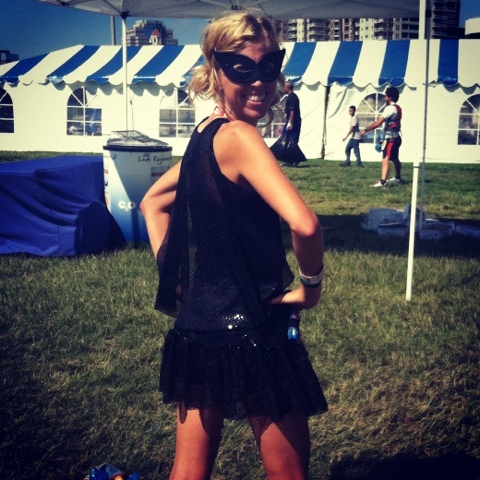 It was a teenage dream of mine to be Batgirl. I love how my black Team Sparkle skirt, a mask, an iron-on logo, and custom-made cape made that possible. Of course the best part of the race was seeing my husband and baby boy cheering me on at miles 17 and 20. I got a little teary-eyed as I thought how much they love and support me. It's a tradition of our to head to Ruby's about a big race for indulging in good food. The cookies 'n cream shake was perfect. Running the marathon was so worth it! If you live anywhere but Southern California, you might be experiencing the change from summer to fall. But here, we can still enjoy bonfires on the beach. And that means S'MORES! I've made s'mores cupcakes before, but they didn't look anything like this. Java Cupcake posted a recipe for "End of Summer S'more Cupcakes and now I really, really want some. I love the way she decorated them too. You can find the recipe and more photos here. Are you a big Food Network fan (like me) and wish you could visit every restaurant, bakery, and food truck featured on all the shows?! Then the new Food Network app is perfect for you! The new On the Road app recommends and lists all the great places featured on the top Food Network shows, such as The Best Thing I Ever Ate, The Great Food Truck Race, Cupcake Wars, and Diners, Drive-in & Dives.. You can find what's nearby if you're in a new city or you can find restaurants recommended by your favorite chefs. 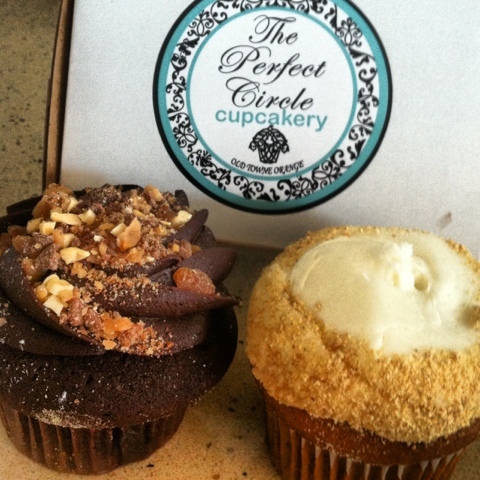 I did a search of what's near my house and found The Perfect Circle Cupcakery was the closest place, as they were contestants on Cupcake Wars. I love having a cupcakery so close, but I wish their cupcakes weren't so dry. I know this app will be super useful on my next road trip. Anyone else tried it yet? Looking for a sure-win cupcake recipe? One of my new favorite blogs (Best-Friends for Frosting) complied a list of favorite cupcake recipes from 28 popular blogs. From Our Best Bites to Two Peas & Their Pod to Bakers Royale to Love From the Oven, you can find their favorite cupcake recipes right here on this ever-so-helpful post from Best-Friends for Frosting. Every recipe is guaranteed to be a winner, so starting baking! October 7th marks the start of the second season of Halloween Wars, a spin-off of Cupcake Wars. This series is a four-episode competition where five teams battle to create the best Halloween display and win $50,000. One team is eliminated each week by a panel of judges made up of Tom Savini (make-up artist and horror actor/director), Shinmin Li (renowned cake decorator), and a different rotating judge each week. Will you watch?